The Eastern Bluebirds (Sialia sialis) - also regionally known as Azure Bluebirds, Common Bluebirds or Blue Robins - are popular, well-known song birds found across eastern North America. Their range stretches south to Nicaragua in Central America. These beautiful little birds are readily recognized by the male's vivid royal blue upper plumage, reddish-brown chest and white abdomen. Within their range, these birds are quite distinctive. 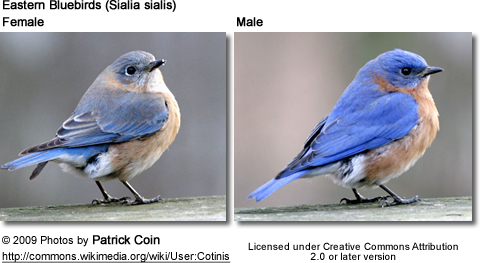 The only other birds they could be confused with are their cousins - the Mountain Bluebirds (Sialia currucoides) and the Western Bluebirds (Sialia mexicana). They share similar plumage details, behavior traits and habits. However, they occupy different ranges with only some overlap in the mid-west and central parts of the United States. 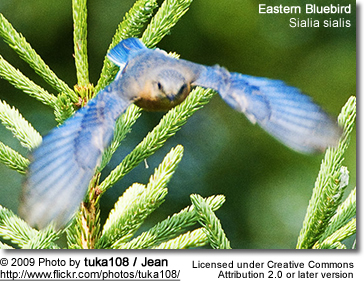 The Eastern Bluebirds occasionally hybridize with Mountain Bluebirds in areas where their ranges meet. During the migration - or at their wintering sites - these social birds may gather in mixed-species flocks of a hundred birds or more that may include - at least in part of their range - Yellow-rumped, Palm and Pine Warblers as well as Dark-eyed Juncos. However, during the breeding season, they tend to aggressively defend breeding and feeding territories. During the winter, they are also known to attack birds entering their favorite feeding areas. 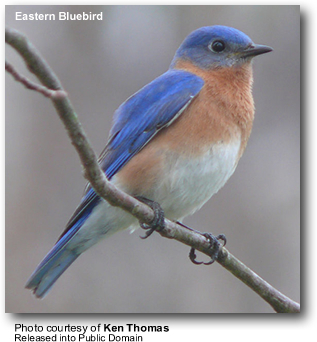 The Eastern Bluebird is the official State Bird of Missouri and New York, USA. Bluebird houses and their impact on conservation: The species are favorites for bird watchers and even though these insect-feeding birds will not generally use bird feeders, they do readily accept man-made nest boxes. In the 1930's, the numbers of these delightful little birds declined at an alarming rate due to a combination of competition for nesting sites with other birds, the use of pesticides and loss of suitable habitat. However, artificial bird houses have helped reverse the decline. 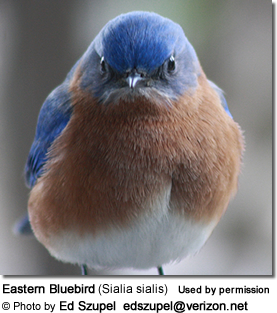 When faced by predators, Eastern Bluebirds will flick their wings and warble. Males emit song-like warning cries. Migration and Flying Speeds: Bluebirds found in the northern part of their range are migratory - breeding in the north and moving south for the winter. Some populations breeding in Canada migrate as far as 2,000 miles to their wintering grounds. These bluebirds have been measured at flying speeds of 17 miles per hour. Bluebird Mythology: Navajo Indians considered these birds sacred because of their sky-blue plumages, and they included Bluebird songs amongst their tribal music traditions. Many tribes consider these birds symbols of spring and happiness, love and hope. The Cherokees associated Bluebirds with the wind and believed that these birds could predict or possibly control the weather. 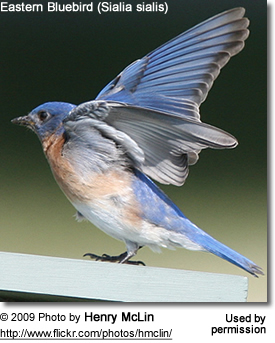 Historically, spotting a Bluebird was believed to be a lucky sign. 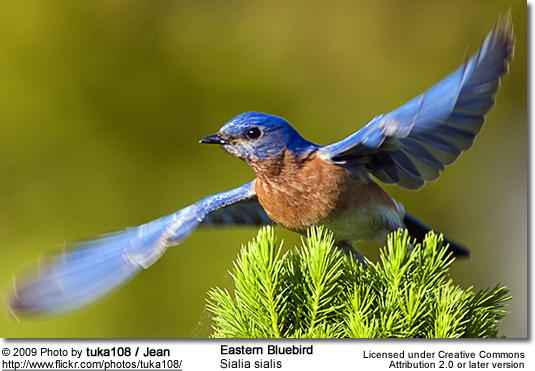 Eastern Bluebirds are fairly common in southern Canada and the eastern three-fifths of the lower 48 states of the USA (east of the Rockies). They are rare and uncommon in southeastern Arizona, and vagrants in Alberta, Canada and Utah, USA. They have recently reported in western Colorado. They have also been seen in Cuba. From the US, their range stretches south through Mexico to Nicaragua in Central America. They inhabit open woodlands, fields, pastures and orchards, and have also adapted to living in suburban settings, including parks and gardens. They prefer open areas with scattered trees for perching, nesting and feeding. Those birds found in southern parts of their range are often resident (non-migratory), except possibly traveling short distances. On the other hand, northern populations are entirely migratory and typically travel in flocks to and from their winter territories in central and southern United States and northeastern Mexico. Spring migration takes place between February to April, and most return to their winter range when temperatures drop and food sources become scarce (around October). Range: Somewhat migratory. South central and eastern Canada and eastern USA south to northeastern Mexico. Non-breeding populations are also found in northern Mexico, Bermuda and Cuba. Sialia sialis sialis [episcopus] - Proposed race. Most include them in the nominate form. Range: Breed in the mountains of south central / south eastern Arizona south through montane central Mexico as far south as the Mexican state of Guerrero. Wintering territories range south to Guatemala in Central America. Resident populations exist. Azure Bluebird (Sialia sialis [azurea]) - Subspecies of sp. fulva, although no universally recognized. Range: Eastern Honduras and northeastern Nicaragua. Medium-sized thrushes. About two-thirds the size of the American Robin. Several cases of albinism (white plumaged birds) have been reported. Females generally larger in size. Fledglings have a greyish plumage with a speckled chest and blue-tipped wings. As they grow older, the blue color becomes more prominent and the speckles on their chest disappear. 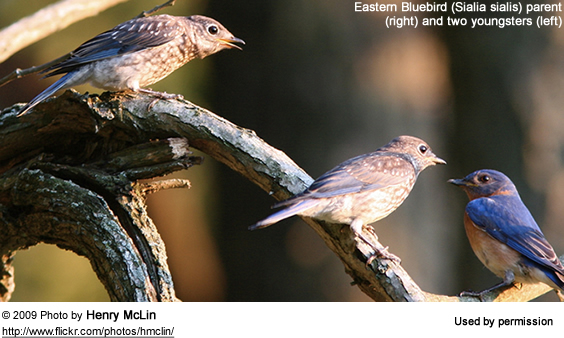 Male Eastern Bluebirds can most easily be differentiated from the related Mountain Bluebirds by their pale bellies. 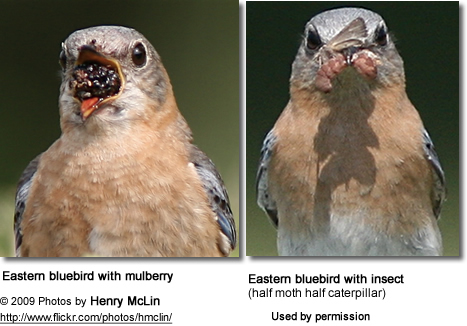 Male Western Bluebird have all blue heads and the plumage is typically a deeper blue. They also have some rufous markings on the upper plumage, in particular on the "shoulders" (scapulars). During the spring and summer months, adult bluebirds mostly feed on insects and other invertebrates, including grasshoppers, crickets, caterpillars, katydids, beetles, as well as earthworms, spiders, millipedes, centipedes, sow bugs and snails. These insect-eating birds are helpful in controlling insect populations without the use of toxic pesticides. During the winter - when insects are less available - their diet is made up of wild fruit, plants, such as blackberries, bayberries, pokeberries, honeysuckle, dogwood, red cedar and wild grapes. They will also take seeds, grains and nuts. 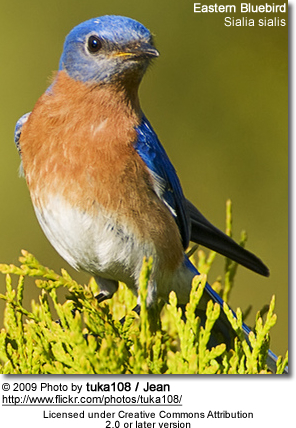 Eastern Bluebirds breed in the spring and summer, typically raising two broods each season in the northern portions of their range and populations breeding further south, may raise up to three broods in a season. The number of broods depends on weather conditions and availability of insect prey (food) needed to raise the young with. Males attract females by taking nesting materials to potential nesting sites and displaying to the females to attract their attention. They will be waiving their wings while sitting perched on their chosen nest site. As soon as a male's efforts are successful, the female will take over and build the nest. Nests historically were tree cavities (such as abandoned woodpecker holes) or other cavities that provided adequate protection. Nowadays, artificial bird houses are often readily accepted. Nests are usually several feet above the ground. The female constructs inside the cavity a small, cup-like structure out of stems, grasses, pine needles, and roots, and lines it with finer grasses, feathers or down, and mammal hair. The whole process usually takes her about ten days. 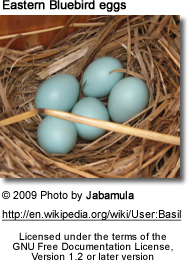 A clutch may consist of 2 to 7 eggs (the average being 4 to 5). The eggs range in color from white to bluish. The female alone incubates the eggs for 12 to 16 days. The hatchlings are naked, blind and completely helpless. The female generally broods them for up to seven days until she will venture out to feed and hunt food for the young. During the initial brooding period, the male feeds both the female and the young. Once the young are old enough to be left alone, the female will help feed them. The young fledge (leave the nest) when they are about 15 to 21 days old. Once the young are independent, they may remain with the parents and help them raise another brood. Their musical calls are described as varied, with songs that sound like two-noted too-lee, chiti WEEW wewidoo, or other mellow series of warbled phrases. The male's calls are soft warbles of jeew or chir-wi. 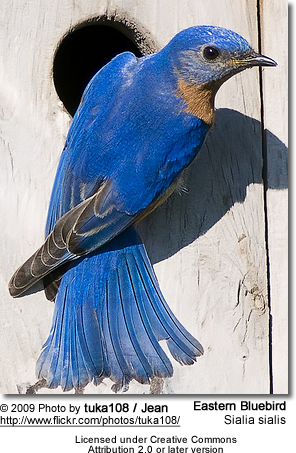 Eastern Bluebirds can live 8 - 10 years. The oldest recorded bird was 10 years 5 months old. However, most birds don't make it through the first year due to harsh environmental conditions during the nesting period to some extent, but primarily they fall victim to predators, such as cats, chipmunks, squirrels, raccoons, and larger birds. Artificial Bluebird Houses: Bluebird trails were implemented, where lines of bluebird houses were put up, monitored and maintained. The information gained by these measures were helpful in gaining a better understanding what is needed to help these birds survive. 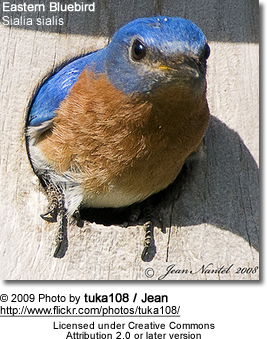 Backyard birders properly designed and strategically placed bird houses, which resulted in increased numbers of bluebirds.